Julien Offray de La Mettrie (December 19, 1709 - November 11,1751) was a French physician and philosopher, and one of the earliest of the French materialists of the Enlightenment. 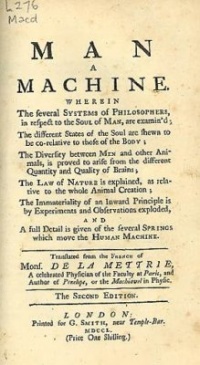 He is best known for his work L'homme machine ("Machine man"), wherein he rejected the Cartesian dualism of mind and body, and proposed the metaphor of the human being as machine. He was born at Saint-Malo. After studying theology in the Jansenist schools for some years, he suddenly decided to adopt the profession of medicine. In 1733 he went to Leiden to study under Boerhaave, and in 1742 returned to Paris, where he obtained the appointment of surgeon to the guards. During an attack of fever he made observations on himself with reference to the action of quickened circulation upon thought, which led him to the conclusion that physical phenomena were to be accounted for as the effects of organic changes in the brain and nervous system. This conclusion he worked out in his earliest philosophical work, the Histoire naturelle de l'âme (1745). So great was the outcry caused by its publication that La Mettrie was forced to take refuge in Leiden, where he developed his doctrines still more boldly and completely, and with great originality, in L'Homme machine (Eng. trans., London, 1750; ed. with introd. and notes, J. Asszat, 1865), and L'Homme plante, treatises based upon principles of the most consistently materialistic character. The ethics of these principles were worked out in Discours sur le bonheur, La Volupté, and L'Art de jouir, in which the end of life is found in the pleasures of the senses, and virtue is reduced to self-love. Atheism is the only means of ensuring the happiness of the world, which has been rendered impossible by the wars brought about by theologians, under the excuse of an inexistent "soul". When death comes, the farce is over (la farce est jouée), therefore let us take our pleasure while we can. La Mettrie has been called the Aristippus of modern materialism. So strong was the feeling against him that in 1748 he was compelled to quit the Netherlands for Berlin, where Frederick the Great not only allowed him to practise as a physician, but appointed him court reader. There La Mettrie wrote his major book "Discours sur le bonheur" (1748), which caused the "ban" by leading enlightenment thinkers as Voltaire, Diderot, D'Holbach. His collected Oeuvres philosophiques appeared after his death in several editions, published in London, Berlin and Amsterdam respectively. Unless indicated otherwise, the text in this article is either based on Wikipedia article "Julien Offray de La Mettrie" or another language Wikipedia page thereof used under the terms of the GNU Free Documentation License; or on original research by Jahsonic and friends. See Art and Popular Culture's copyright notice. This page was last modified 09:23, 28 May 2010.